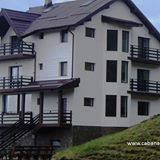 Cabana Transalpina is the highest and the most beautiful chalet in Ranca. It is situated in the Parang Mountains, under the Papusa Peak (2136m), at an altitude of 1756m, at 20km Novaci and 25km Obarsia Lotrului. The access is by the Transalpina Road (dn 67c km 34+800), at the exit of the Ranca mountain resort (when coming from Novaci) or at the entrance of Ranca (when coming from Obarsia Lotrului). The chalet is at a distance of 75m from the road. It is near the ski lift Ranca1, in the alpine zone and it offers a panoramic view of the area. It features 8 rooms (maximum 18 persons): 6 double rooms with matrimonial beds, each with Tv Led, a private bathroom, and a balcony, also 2 penthouse rooms, with private bathrooms and Tv Led, with beds for 3 and 4 persons. Tourists can use for free the fully-equipped kitchen, the dining room with Tv Lcd and audio, the Wifi Internet access, the 120 mp patio, the outside grills and the parking lot.